We used to run down the staircase, grab the bannister, and do an airborne 180 (thereby redirecting ourselves toward the kitchen). 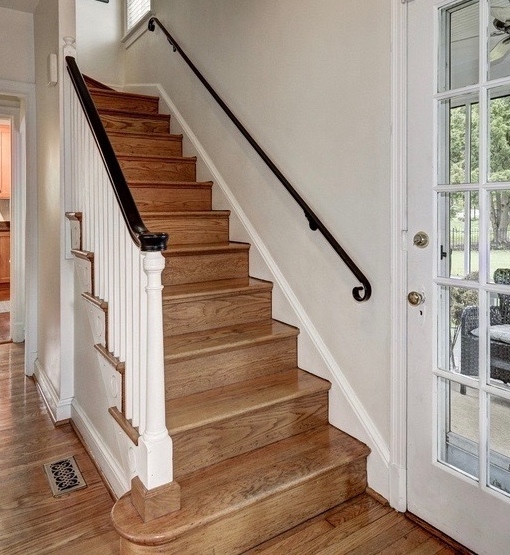 Finally being able to afford a three-story house, complete with a lovely oak bannister along the stairs. Rejoicing as there is now enough space for your growing family (i.e., you can stop fights by putting each kid in solitary confinement). Spending a weekend cementing the once-lovely bannister back into place after your horde of children have repeatedly ripped it off the staircase. 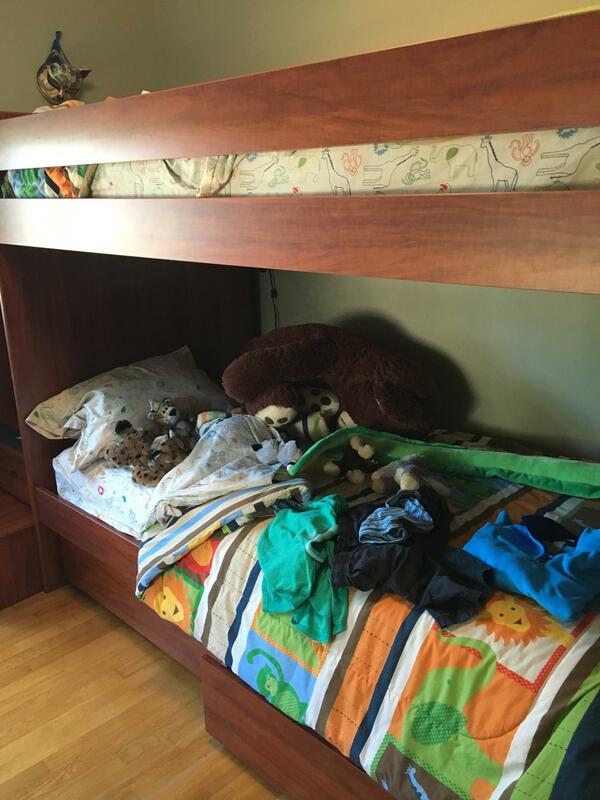 Watching your kids’ delight at having new bunk beds to turn into ships, trains, and forts for their stuffed animals. Watching the plaster and paint fall off the ceiling below the bunk beds every time a kid jumps off the top bunk. Watching the bathtub water turn red after a kid falls (or was PUSHED) off the bunk bed and cracks her head on the radiator. Being able to afford to hire TWO babysitters for DOUBLE the going rate. Being unable to find babysitters brave enough to watch your kids despite offering double the going rate. Getting an entire afternoon alone when your kids all work together on an “exciting project” in the backyard. 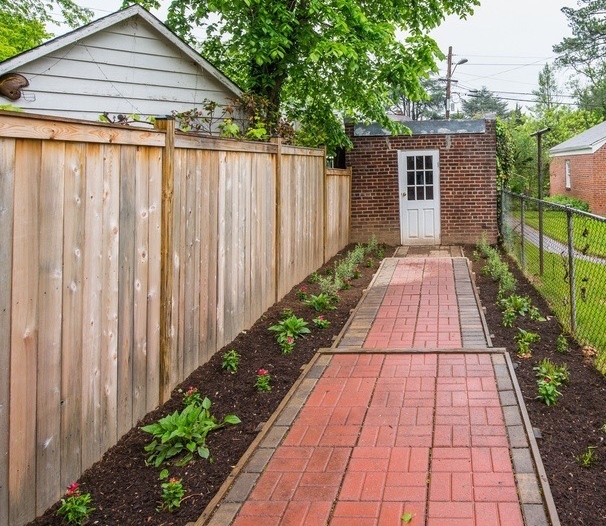 After the hole, a brick patio. Sleeping in when an unexpected blizzard shuts down D.C., knowing that your delighted kids will be happily occupied for hours before they turn on each other. Discovering your kids BROKE THE STORM DOOR forcing their way out of the house to play in the snowdrifts. Discovering you will never make enough money to send your kids to college without going into extreme debt. Dropping your high school children off at the mall and telling them not to come home without jobs. Discovering that they actually found jobs. Discovering that your son is accepted into the Naval Academy. Getting a postcard from your son that reads: “Dear Dad, I am oppressed, depressed, and fatigued. Please send food,” and knowing that he IS going to make it. Finding out that Daughters #2, #3, and #4 got scholarships to college. Finding out that Daughter #5 is pregnant by a convict and dropping out of college. Watching your Last Daughter head to college. Sending Daughter #5 money to go back to college. Realizing all your kids have college degrees. Sending one of your kids money for a new roof after squirrels ate the old one. Realizing one day that all your kids have more advanced than degrees you do. Realizing that none of your kids have asked for money in years. Realizing that your kids now have more money than you do. Realizing that none of them need you anymore. Getting Father’s Day cards and calls from them anyway. So fathers day is now in the USA? Seems like it is celebrated everywhere on a different date and also differently. I think we thought our hole would magically transform into a beautiful blue pool one we filled it with water. Not so much. Awwww! My Dad died when I was 10 so my memories of him are from that first decade of life. I was the only girl so of course I was a princess. (Eventually becoming a diva — I took my position in the family seriously) Love your short clips on your family. Give your Dad a hug from me. Surviving deserves it. I wanted to be a diva. My sisters and brothers wouldn’t let me. Not nearly as tough as his birthday. He’d be well over 100 by now. We never did birthdays in a big way in my house (and he was buried on my birthday) but I remember him most on his birthday. I’m still sort of a diva but the cats have tempered that quite a bit. Feline divas trump human divas. Is there a non-diva feline? Even my klutzy Commando Cat was a diva. Hazel is not a diva. Only cat ever! Kate what the hell. Both the youngest of three and only girl? Both lost our dad around the same age? Similar careers. Same sense of humor. Cats. I feel like you may in fact have hijacked my life. Almost the way I am hijacking Autumn’s blog post. This is very eerie. Did you know I had red hair (thanks to Clairol) for about 5 years (and it runs naturally in my family). It certainly explains a lot, doesn’t it? You guys are cracking me up. Hijack away. As long as it’s not about Donald Trump, because I swear, everything seems to be all about him these days. You guys are a welcome relief. This made me smile! I lost my dad when I was 9 but remember some of the things my older brothers and I forced him to endure. Father’s Day is hard for me even now so very grateful to see this post! I’m glad we made you smile and remember the funny (well, funny NOW) hardships all dads endure. It is a tough day — for every child who lost a decent dad, and for ever child trying to escape the damage done by a toxic one. The is a hilarious post and had me grinning from ear to ear. Your family sounded like a handful to your dad growing up. Plaster from the ceiling raining down over the bunk beds – you must have been really bored or that is just plain fun (fun, yes!). After so many times, I wouldn’t be surprised if you dad didn’t bother getting the ceiling repaired. I am sure above all, your dad was rather entertained by all of your antics over the years. Must have been a good show when you were all younger. And then, as time goes on, it gets lonely. Bored. We were so damned bored. We were too poor for electronics and they were crappy back then anyway. There were only so many games of Monopoly we could play before bloodshed occurred. They make for good stories now. Too many for one post, what with me destroying a coat rack and my sister swinging on hanging lamps. But I am glad the selection entertained you! I think there was a lot of repair work before we moved. What a lovely tribute! But since you write anonymously or under a pen name, does your family ever read it? Just curious. I know you can send him what you wrote via card or email. You did send him this, right? I’m sure it would make him feel crazy proud and loved. Dad read this post and said I left out a few incidents, including one where I traumatized one of my siblings as the “Masked Avenger,” but did agree that writing all the stories would have taken a novel. I tried to focus on the ones that involved multiple siblings and went with the physical/ financial damage narrative. Does your family read your blog? Your mother must, right? Actually, there was a time when my mom and brother tried to stop me from pursuing writing. So, that’s where I’ll leave it. It’s okay though. I’ve accepted it. Glad to hear your Dad reads your blog though! He must keep it a top secret, eh? I mean from the other sibs? Wordfence. Heh, heh. Perfect. Actually, most of MY family figured it out. I had told just three of them. One sibling was indiscreet and put a funny post on her FB page and BAM! Suddenly they all knew. But my siblings are good sports, and some of them even let me use their pictures. It’s pretty funny that they all use the names I gave them as their user/ commenter names, too. Autumn, you are like a calendar, you remember every holiday! Do you also remember all your family members and friends birthdays? (My mum is like that, haha). In Spain Father’s Day is March 19th, because that day is St Joseph. Sometimes! Sometimes I forget. But having a planner and an iCalendar helps. I winced at the bathtub story about water running red… ahhhhh!!! People complain now about having one child alone, but 8 kids must have been pure insanity. Your dad must be really proud of all of you. And for all of you to be so amazing and prestigious and turn out so great, he must have done something right. Man, what a childhood you had. Haha I laughed at the mall comment… is that when you worked at the clothing store? Anyway, happy fathers day to your dad! Oh, yes. Pure insanity. Someday I am going to have a blog called, “Think You Want A BIG FAMILY? Think AGAIN!” Some people in my book club found “The Glass Castle” impossible to believe, especially the part where the main character fell out of the car and her parents didn’t notice for miles. I thought it was spot on, of course. I love Fathers Day when they take me out to eat and I wind up paying. They also bring along the in-laws and grand kids. OMG. It’s worse than a collect phone call. It’s a collect dinner! Do they even offer to pay? Or are they just bad at wrestling for the check? 25 cousins, egad! That is impressive. Or maybe scary. Luckily I was one of the bigger ones, so I was not in the hole, either. That honor belonged to Brilliant Blonde Lawyer Sister. She pretty much grew up screaming, “It’s not fair!” Law School surprised none of us. The youngest one STILL has to fetch and carry for us to this day. It’s become an inside joke of sorts. And I find it amazing fun actually, but that’s probably because we all mesh pretty well together (I think it’s the same sense of humor). I can see how it could have turned out way differently. And now, to quote one of my friends “Man, that’s sad.” Also, your post made me think of “Home Alone” and “Dennis the menace” with all those stories about kids being difficult to look after due to all the mischief they’re up to. Oh, yeah, squirrels can really mess up roofs. I think they tear our wiring, chew up wood, etc. Had we been better supervised, we might not have gotten up to such mischief. We definitely wouldn’t have been so challenging if there were less of us. Then, I guess I am lucky, because when I was little the only squirrels I saw were up in the old nut tree, away from the rooftop. I suspected they were quite pleased with the food they had there. Plus, they might have been quite shy around people. So yeah, they stayed away. Our squirrels are bold. Probably because a woman down the street feeds them. This is why Andy goes after them with nerf weaponry. We don’t want to replace our roof. Ahahah. That made me laugh, because I remembered that video on your Instagram. xD You go, Andy! Save the roof!